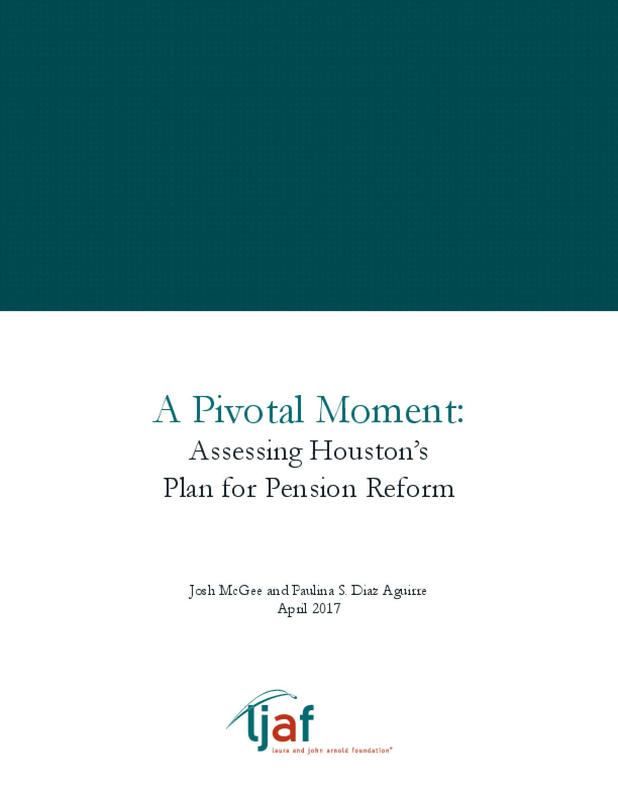 The Laura and John Arnold Foundation (LJAF) released "A Pivotal Moment: Assessing Houston's Plan for Pension Reform," a report that provides an in-depth analysis of the City of Houston's pension reform proposal currently pending in the Texas Legislature. The report finds that the proposal includes important changes that would help protect workers and taxpayers. The reform plan was developed following discussions between Mayor Sylvester Turner and the Houston Police Officers' Pension System, the Houston Municipal Employees Pension System, and the Houston Firefighters' Relief and Retirement Fund. LJAF Vice President Josh McGee and LJAF Sustainable Public Finance Analyst Paulina S. Diaz Aguirre co-authored the report after analyzing the city's proposal and conducting independent pension modeling. They say that it is incumbent on local leaders and state legislators to work together. "There are just a few weeks left in the 2017 session—and without the ability to make changes to the pension systems on its own—the city is running out of time," the report states. "Without changes, the debt could spiral into a full-scale financial crisis. The city cannot allow that to happen. Its financial future hangs in the balance and will be decided in large part in the next month." Houston currently owes $8.2 billion in pension debt—more than any other city in Texas. It does not have enough money to pay for nearly half of the retirement benefits workers have already earned. This unfunded liability threatens workers' retirement security and has a direct impact on city finances. During the past 10 years, the city has cut public safety positions even as spending on public safety has grown by hundreds of millions of dollars due to a 55 percent increase in pension costs. The proposal seeks to address critical flaws in the city's funding practices. Under the proposal, the city would lower its assumed rate of return on investments for all plans from 8 percent or more to 7 percent; reduce benefits for public workers; and implement a financial corridor provision that would cap the city's contributions to the pension plans. The financial corridor provision is a key element of the proposal. The provision would set a minimum and maximum city contribution rate for each plan. If the city were to hit or surpass the maximum, workers would be required to make additional benefit concessions to bring costs back under the cap. LJAF's analysis shows that this mechanism would provide substantial new protections for taxpayers but would also significantly increase workers' exposure to risk. The report states that the proposal's long-term impact on workers would depend on demographic trends and the plans' investment performance, two factors that would influence how often the city would hit the cap. For example, LJAF's modeling shows that there is a two in five (40 percent) chance that the city's contribution rate would hit the maximum for the police fund at least once by 2027. If the police plan were to earn less than 7 percent on its investments in the short or long term, contribution rates would hit the cap even sooner. If investment returns match the city's assumptions, there is roughly a one in three (33 percent) chance that contribution rates for members of the police plan would increase by five percentage points or more in the next decade. Given that members of the police plan—as well as members of the other plans—have already agreed to billions of dollars in concessions, McGee and Diaz Aguirre explain that the city has an obligation to uphold its end of the bargain. They state that the city should make payments on time and in full and should take steps—such as limiting investments in risky assets including real estate, private equity, and hedge funds—to protect workers. In addition, if the proposal is implemented, the report states that the city should also make good on its promise to provide a lump-sum payment to the two plans with the largest deficits—the police and municipal employees plans. The city has proposed issuing $1 billion in pension obligation bonds to cover the payments. To benefit financially, Houston would need to earn more in the market than it costs to borrow the money. Given the current market conditions, the spread between expected bond interest rates and expected returns is relatively small. Despite the fact that the bonds pose some risk, the report argues that they are a good-faith measure that reflects the city's commitment to upholding funding promises. The report concludes that, "In the short term, the proposal would place the pension plans—and the city—on firmer financial footing. The long-term impact would depend on how the changes are implemented." It also states that Houston should make further changes to establish a comprehensive, permanent solution to its pension problems. This would include creating retirement systems for new workers that are simpler and easier to manage such as a Defined Contribution plan or a Cash Balance plan. Copyright 2017 by The Laura and John Arnold Foundation. All rights reserved.